There it was, on the front page of the New York Times: One of Gotham's most notorious tabloids was hiring away the Washington Post's star gossip columnist. 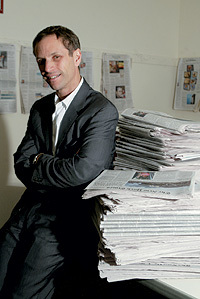 On February 13, Adam Moss left his position at the New York Times to become editor-in-chief of New York magazine. "New York is one of the world's great magazine franchises and I could not pass up the opportunity to lead it into a future as dazzling as its name," Moss said. "It's with mixed emotions that I leave this extraordinary newspaper and the trusted colleagues and great friends who have made working at the Times so rewarding." "The knives are already out for Lloyd Grove…," the piece began playfully. To an inveterate Times-watcher, it wasn't the article's subject matter or cheeky tone that startled on that September Sunday. After all, the very same Times had profiled packaged pop star Britney Spears on its front a year earlier. The "gray lady" of West 43 Street had long since gone technicolor. No, what raised eyebrows this time was the Times' decision to use boldface type to highlight the various names in the Grove piece—front page imitating gossip column. Artful? Perhaps, but did it detract from the high-mindedness of an institution whose core mission has long strived to uphold democracy by forthrightly wielding truth against power? Adam Moss '79 doesn't think so. As the new assistant managing editor for features at the New York Times, Moss says the boldface gossip story wasn't his doing. That decision rested with executive editor Bill Keller and reflects Keller's interest "in spicing up the paper in various ways, and his own feeling that the paper needs to be fun." That sensibility, Moss says, "comes from the same place that decided the job that I have was a job that needed to be filled." Since August, Moss has been entrusted with the Times' "cultural" news portfolio—a daunting challenge at a famously tradition-bound institution, even for an editor widely praised for transforming the Sunday New York Times Magazine from, in Moss' words, "a collection of articles lacking its own DNA" into a must-read, general-interest magazine. Moss now oversees the Sunday magazine and the culture and style sections, as well as Circuits, Real Estate, Travel, Escapes, Book Review, and other special sections. Many of those sections arose during Moss' 12-year tenure at the Times, initially as a consultant and then at the Sunday magazine, which he edited from 1998 until last summer. During that time, the definition of what constitutes news in our country was broadly expanded by the U.S. media. Yet as patterns of information consumption changed and traditional newspaper readers aged, advertisers still craved the coveted 18 to 34 age demographic. The Internet bloomed, the continuous news cycle dawned, and the Times, like most of the nation's top newspapers, became more magazine-like. And if there evolved in that time a consensus that journalism should be as much about putting up a mirror to our lives as about raking the muck—acknowledgment that the personal is the political—then Moss could be said to have been a factor. "We tried to prove to readers that their own lives were as interesting as someone else's," says Moss of his run at the Sunday magazine. During breakfast at a midtown Manhattan hotel, he is a disarming mixture of brains and modesty. His dress is smart, casual, and open-collared. You sense that he feels much more comfortable asking questions than discussing himself, so we are simply journalists talking shop.